India’s largest real estate firm DLF plans to raise Rs.2,100 Cr through institutional placement program (IPP)- a system in the market in which the stakes are sold to qualified institutional buyers. 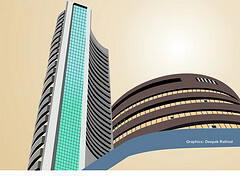 DLF to raise Rs.2100 Cr through IPP. DLF, India’s largest real estate firm, by April 2013, will raise over Rs.2100 Cr via selling its shares to qualified institutional buyers. The real estate major will sell around 8.1 Cr shares of the firm to raise the fund. Though the move is in line with the guidelines specifying 25% public shareholding, the main aim of the move is to help the firm reduce the debt. However the Rs.2100 Cr fund is one of the biggest ever- raised through IPP, in India. An official said that they have already started discussions with the bankers. He added that the firm is likely to appoint around three or four merchant bankers soon for the purpose. Though the pricing is not yet done, the official said that the shares will be priced either at the current market price or there may be a 5% discount in the existing prices. However the prices will be as per the prescribed guidelines of IPP, he added. DLF will raise Rs.2100 Cr through divesting their shares via IPP. Kushal Pal Singh- led Realty firm can amass over Rs.2100 Cr via IPP at a base price Rs.267.95 (Friday’s closing price on BSE rate). The total market value of DLF is Rs.45514 Cr out of which 78.58% are in the hands of the company promoters. After their sale- through IPP, the promoters’ share will be reduced to 75%. With regard to the Public Float requirements, the company will act in conformity with the Directives of the Securities Exchange Board of India, a DLF spokesperson told the media. In August 2010, Market Regulator SEBI had requested the top-listed companies to allow 25% of minimum public shareholding by June 2013. The market regulator had prepared the list of 193 companies. Though companies can issue fresh shares in the IPP route, these shares cannot be priced at a discount of more than 5%. This is one of the major limitations of IPP which is very similar to qualified institutional placement (QIP). This is what differ IPP from other Offer-for-Sale (OFS) route. Unlike OFS, IPP route restricts the firm to divest maximum 10% of shares in one transaction. On the other hand OFS does not restrict anything like this. OFS neither restrict the discounts or the amount of divestment. Promoters are given absolute freedom in OFS –route of divesting the share. In 2012, the real estate major DLF also had raised Rs.6,000 Cr by divesting hotels, wind mills and prime land parcels in Mumbai. Still the firm is believed to have Rs.18000 Cr of debt. However DLF expects to write-off their existing debts through IPP. This entry was posted in Real Estate News and tagged DLF, institutional placement program, IPP, Offer-for-Sale, OFS, qip, qualified institutional placement, Share market, Shares by designer. Bookmark the permalink.